A couple decades ago my pal John Altman was doing a session with jazz violinist Stéphane Grappelli. The producer in the booth asked Grappelli to play like he did with Django Reinhardt back in 1936. There must have been an uncomfortable few seconds, perhaps a sigh. “I wouldn’t know how” Grappelli said. People sometimes ask me to recite passages from something I wrote as if I had it all memorized. This doesn’t happen as much now but when I was writing my jazz column it was a regular occurrence, sometimes two or three times a night. What was that you said about this gig? I almost never had a clue what I’d said about the gig. No idea. Why would I? I’d already written it. It was gone. Tucked into some corner of the memory, probably, filed away, and in all likelihood never to be seen again. I can’t even recognize my own writing lots of times. People have quoted me to me without me knowing it. I ask who wrote that and they stare at me. You did. I apologize. They’d give me a look, like I must be some kind of jazz critic idiot savant. Once I laughed aloud and said what fool wrote that? It was me. I don’t ask that now. But I still find it weird that people assume I can just recite anything I wrote. Because that’s not how it works. You’re writing in the moment. And once done, you put that writing away and think about what you’ll write next. There’s nothing in the creative process that enables you to go back and recite by rote anything you’ve written. Indeed, of the million or so words I’ve written in the last twenty or so years, I can recite but one line: “Broken back mountains, a lizard, a snake, and the meaningless rippling of sand”. And I remember that only because it pops into my head every time we drive that desiccated little stretch of Highway 111 on the way into Palm Springs. That is it, the only line I’ve ever written that I can repeat from memory. I can’t see how improvising a jazz solo would be any different. It’s purely of the moment. You’ll never create the same solo again. You might re-create it, if you listen to a recording and figure out exactly what it was you did, but next time you’re playing that piece and its your turn, that same solo will not emerge from the bell of your horn. It’s the same with words. The second draft is always a new creation. Jazz soloing is pure creativity. Not painting by the numbers. When the band leader points at you you’re on your own. And when you’re staring at an empty screen, fingers poised, that opening sentence comes to you and you roll with it. You have to. It’ll never come to you again. Not like that. Creativity happens only once. 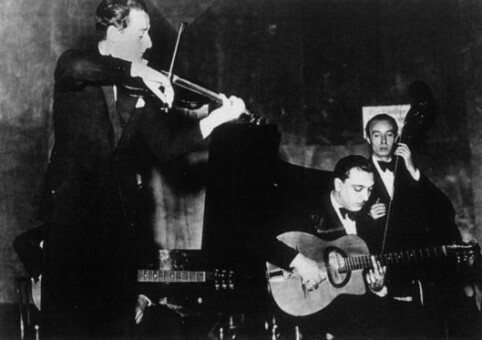 Stéphane Grappelli and Django Reinhardt mid-creation, 1935. This entry was posted in Jazz and tagged Django Reinhardt, John Altman, Stéphane Grappelli. Bookmark the permalink.